Understand the significance of creating water-resistive and air barriers that also provide a needed air gap for drainage and drying of wall systems. Assess the performance aspects of different types of advanced insulation products that create higher R-values in thinner assemblies. Explain the importance of proper detailing and specification writing at areas that interrupt thermal and moisture barriers, including expansion joints. 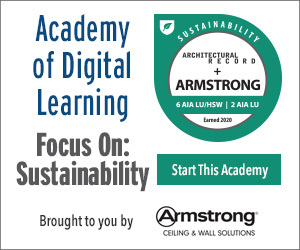 Determine ways to incorporate principles presented into buildings as shown in case studies and best practices. The design of building enclosures continues to receive a great deal of attention by numerous design professions, building scientists, and product manufacturers. Some are motivated by meeting minimum building and energy codes in the most cost-effective manner. Others are seeking performance beyond code minimums to meet voluntary certification or rating programs, or simply to improve building performance over time. Some focus on thermal control in walls, roofs, and floors, while others are concerned with air and water barriers to protect the building and people. Still others look at the details of construction and how to incorporate appropriate continuity of barriers across some of those detail areas. The result of all of this attention has been an ongoing need for architects to stay abreast of advancements and improvements in this arena to keep up with the best options and assembly configurations for buildings under design or renovation. This includes being aware of some of the latest products and how they are intended to be used in order to create successful results. Based on all of the above, this course will examine some of the advanced, high-performance options for effective thermal and moisture control in building enclosures. It will also highlight why it’s important that manufacturer guidelines and best practices for installation are followed. Providing excellent thermal and moisture protection for buildings, particularly in those that incorporate creative forms, requires the use of high-performance products that are properly designed into and installed as part of building envelopes. The use of water-resistant barriers (WRBs) and air barriers (ABs), particularly in exterior walls, is not only required by codes but also critical to good performance of a building enclosure. The codes don’t dictate how to achieve these barriers, they simply provide the criteria for materials to qualify as either one and require them to be continuous. At the same time, the established best practice is to be sure that water or moisture can safely drain away from an assembly if it does penetrate. In exterior walls, the most common way this is achieved is to create a space or gap between the outermost cladding (i.e., siding, masonry, rainscreen panels, etc.) and the WRB surface (i.e., sheathing covered or treated with a water-resistant material). 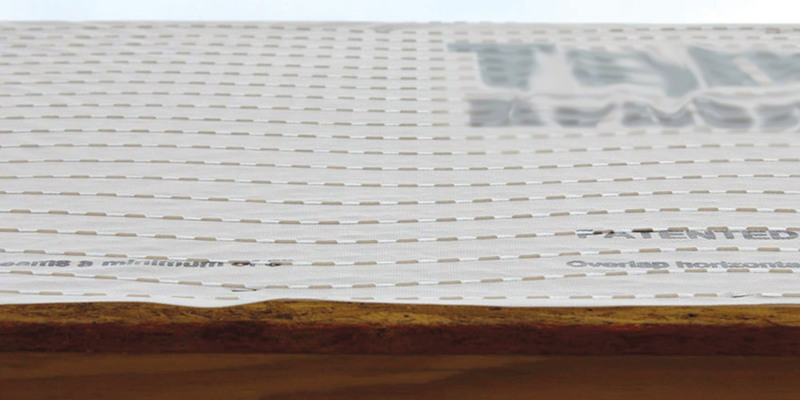 Also quite commonly, the WRB surface contains an air barrier against unwanted exterior air infiltration. Hence, the gap separates the cladding from these barriers and allows the assembly to be considered drainable if it does become wet for any reason. If the barriers also allow for vapor to pass from inside to outside while still resisting bulk water and air on the outside, it is considered dryable as well. It has been noted that traditional construction techniques such as masonry walls manage water and moisture by using a space or gap between the sheathing layer and the masonry veneer (cladding) to allow any accumulated water to exit through weep holes. Similarly, rainscreen installations use a gap between the cladding and the sheathing to allow water to drain away harmlessly and ventilate the space between the cladding and the sheathing that is covered with a WRB/AB. In any wall construction, failure of water to drain away can damage the cladding, or worse, the rest of the wall assembly. 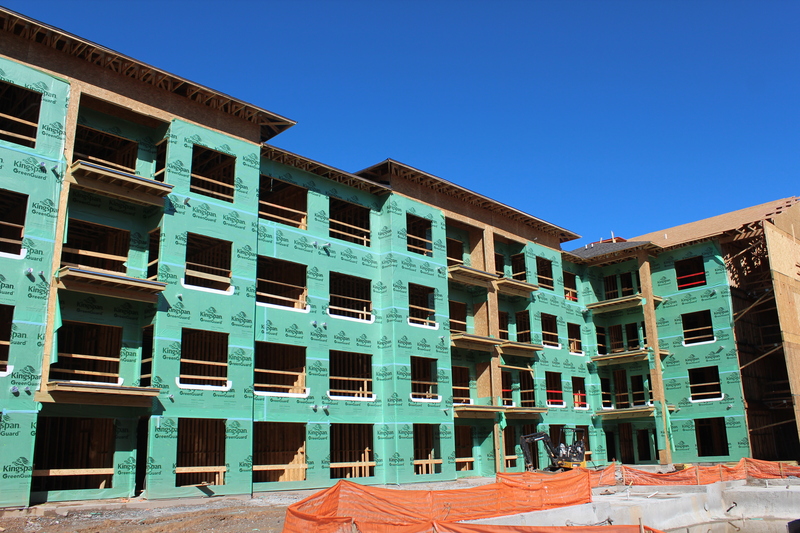 Building wraps are widely used in residential and commercial construction because they provide an economical means to add a WRB and AB over a sheathed exterior wall. Advanced products provide greater performance and add the capability of providing drainage and drying in a wall assembly. Thermally, there is also the increasing use of continuous insulation between the cladding and sheathing. This creates another set of surfaces that may require a gap for drainage and drying in case moisture or water find their way between the insulation and sheathing. Fortunately, the gap does not need to be very large (less than ¼ inch works) so there is little impact on the thermal properties of the insulation. One of the challenges then in designing an exterior wall assembly can be in finding a way to simply and economically provide all of the needed barriers and gaps in the right places. When it comes to providing a WRB, a high-performance, nonwoven building wrap made from a synthetic sheeting material is often selected. The advantages of a modern synthetic wrap product over traditional products (such as building paper) include a WRB that is more durable, and more easily sealed along the seams to create a continuous barrier over a variety of materials or different configurations. Further, if the synthetic WRB is tested for air infiltration, then it can also double as a continuous exterior air barrier meeting the code requirements for both WRB and AB in a single layer. When a high-performance building wrap is used as the WRB in a project, it takes advantage of several innovative advances in its development. First, as an engineered product, it creates a weather barrier behind exterior cladding to protect the sheathing and reduce water intrusion into the wall cavities. This is important in all wall systems since all cladding will likely allow some degree of water intrusion at some point. It is also particularly important in rainscreen assemblies where water is expected to enter behind a cladding material and is allowed to drain away. Second, as a vapor-permeable or breathable product, WRBs allow water or moisture trapped behind it to escape, thus allowing any damp or wet materials to dry in a relatively short amount of time. During this drying, WRBs maintain their water resistance because they are constructed with pores that are large enough to allow moisture as a vapor to pass through but too small for water as a liquid to pass. Third, as an air barrier, a WRB will be an energy-efficient means to stop air infiltration and exfiltration through walls. 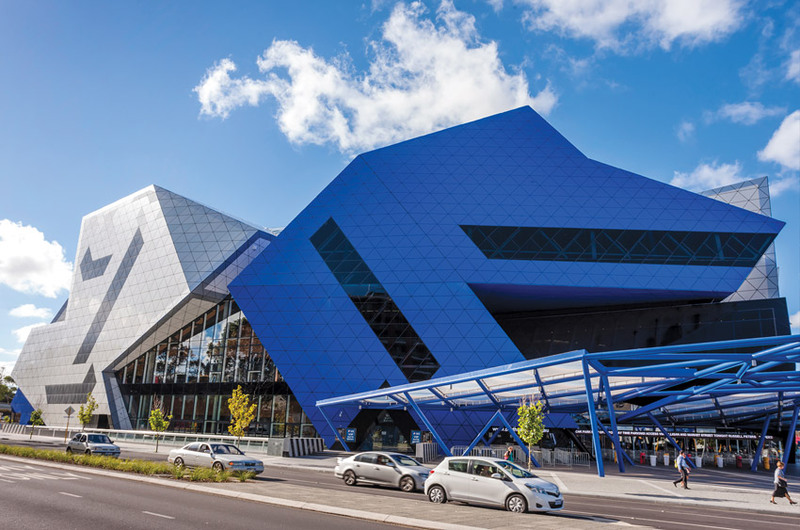 A significant innovation in such high-performance building wraps has been the addition of integral spacers to very effectively create a manufactured drainage gap between the cladding and the wrap. The conventional means to create a gap in a framed wall system is to use furring channels or wood strips. This works, of course, but requires more labor, time, and cost to install that furring. The alternative that has become recognized as a best-practice solution is to use a drainable building wrap that provides its own integrated method of drainage. Specifically, at least one manufacturer creates this gap by bonding noncompressible propylene spacers that are1.5 mm thick (less than 1⁄16 inch) onto a high-performance WRB building wrap. A similar product uses 6.3-millimeter (less than 1⁄4-inch) spacers bonded in the same manner for higher water-risk conditions, such as marine environments or heavy-rain climates. This deep cavity also lends itself to reservoir cladding products—products that shed water but also absorb some of it—especially stucco and thin stone. Drainable building wrap includes noncompressible spacers on the surface of the wrap to create a gap between the cladding and the wrap surface, which acts as both a WRB and AB. This integral gap design provides an effective drainage space or capillary break between the sheathing and cladding material. The depths are large enough to provide true drainage between the sheathing and cladding material but not enough to compromise thermal performance if insulation is installed over it. In essence, drainable building wrap acts as a full rainscreen system in miniature, without the added labor or cost. Further, it will work with all types of cladding systems, particularly those that can be moisture sensitive, such as wood or fiber cement siding. The economical beauty of it is that the cladding can be applied directly over this drainable building wrap, eliminating the labor step of installing the spacers as a separate component. When specifying drainable building wraps, it is important to recognize that there are literally dozens of building wrap products available with wide variations in performance and cost. While most are made from polyethylene or polypropylene plastic, they can vary noticeably in terms of water resistance, drainage efficiency, water-vapor transmission, or breathability. They can also be different in their ability to impede air flow, in their overall durability including tear resistance, and in cold-weather flexibility. In many exterior walls, flammability and smoke developed ratings are important too and need to be considered. Selecting a drainable building wrap that excels in all of these areas will assure best results overall. Beyond the product itself, sealing the edges and seams properly and fully without undue penetrations from staples or nails is critical for good performance and code compliance. Some manufacturers offer full sealing systems that use a compatible adhesive, sealant, or tape. This allows the edges to be held permanently in place, usually by using a hard roller or hand applicator to press the wrap and the tape together. Such products may also use fasteners with plastic heads that minimize the impact of the fastener penetrations and help maintain the barrier continuity. Equally important are the details of how the drainable building wrap deals with openings in the wall, such as doors and windows. Being able to flash and seal the wrap properly with window and door flashing materials will assure that water draining down the face of a drainable WRB will flow away properly and not enter behind other building elements into the wall. It will also maintain the continuity of the air barrier in the overall system. Installed properly, drainable building wrap effectively eliminates excess moisture and mitigates the damaging effects of mold and rot. It is a cost-effective product, particularly when it is manufactured to be installed in any position, horizontally, vertically, or diagonally. Overall, this approach has been shown to have the same drying capability of a 3⁄8-inch rainscreen wall. This is important because there is growing recognition among building scientists and building codes that exterior walls need to drain and dry. That means, going forward, building wrap products will increasingly be judged by how effectively they provide positive drainage of water from the wall. Brian Keith, an architect in Dallas, used drainable building wrap on his own residence because of the complete systems approach that the manufacturer provided. Exposure to water destroys fire blankets and their ratings. The Fireline™ Water Guard® blanket features an integrated waterproof silicone cloth that protects the blanket system and fire rating during and after construction of open structures, such as parking facilities and stadiums. The 1-, 2-, and 3-hour rated floor systems can accommodate joint widths from 2–32 inches wide. Kingspan Kooltherm® offers an extensive range of premium performance insulation for wall, floor, structural ceiling, precast, tilt-up, and rainscreen applications. It has a fiber-free rigid thermoset phenolic insulation core and offers the highest R-value per inch among commonly used insulation. Kooltherm exhibits excellent fire and smoke performance. TAMLYN has brought two moisture management products to the market with TAMLYNWrap™ Drainable WRB 1.5, which gives a noncompressible drainage plane, and TAMLYNWrap™ Rainscreen 6.3, which provides a vented drainage space. Pairing with these is a complete system of flashing, double-sided seam tape, and flashing boots for circular wall penetrations.